Paul Hill's Saugus Rodeo grounds, showing the effects of the Great Flood of March 2, 1938, when the Santa Clara River overflowed and filled Hill's ranch home and arena with mud and debris. As reported in the Los Angeles Times, the "old buildings ... collapsed during the March floods" and the arena was built anew. Nonetheless, Hill lost the ranch sometime after the April 1938 rodeo. According to Reynolds, the property was repossessed by the bank. In 1939, ownership passed to William Bonelli, and it was renamed Bonelli Stadium. He introduced auto racing that same year and eventually renamed it Saugus Speedway. 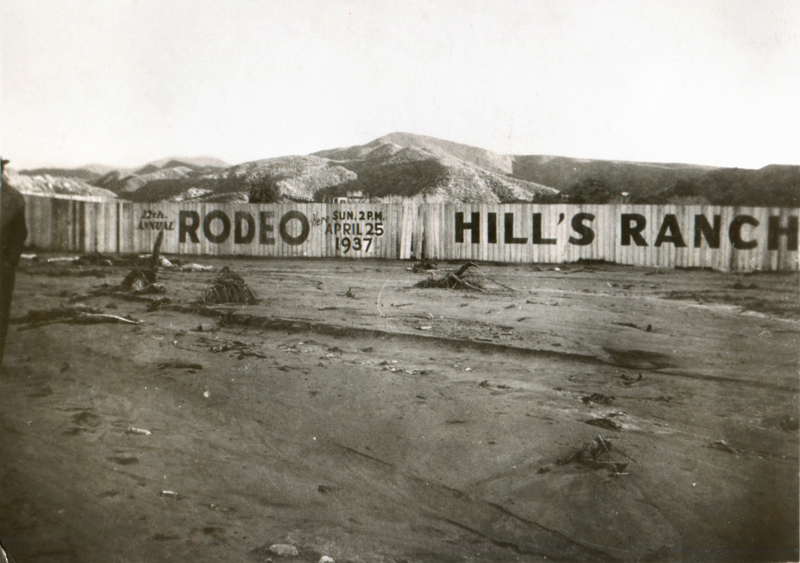 In this photograph, taken on or about March 2, 1938, the fence is still painted with the sign advertising the previous year's rodeo (12th Annual Rodeo, Sunday, April 25, 1937, 2 p.m.). It appears the sign was changed only to the extent necessary; the "2" in 12th, the "5" in April 25 and the "7" in 1937 are all that were changed from 1936. 2x3-inch glossy print from the collection of Jennifer Jones. About the Great Flood of 1938. Surpassing the St. Francis Flood of 1928 in scope — if not in deaths — the Great Flood (aka Los Angeles Flood) of 1938 hit the greater Los Angeles area hardest overnight on March 1-2. By the time the water receded, 5,601 buildings had been destroyed and 113 to 115 Southland residents were killed. Considered a 50-year flood, it started Feb. 27, 1938, when a storm system moved in from the Pacific Ocean and hit the San Gabriel Mountains. The region was soaked with continual rainfall that caused only routine flooding until a second storm came on the heels of the first. Driven by gale-force winds, it hit March 1 at about 8:45 p.m., dumping 10 inches of rain in the lowlands and at least 32 inches in the mountains. Almost every vacation resort in the San Gabriels washed away; most were never rebuilt (see Robinson 1977). As hard as Los Angeles County got hit, Orange and Riverside counties actually sustained more damage because they lacked the kind of flood-control system L.A. had with the Santa Ana River system. (The Santa Ana, Los Angeles and San Gabriel rivers overflowed, too.) But Los Angeles was far more populated; Orange and Riverside counties were largely agricultural. In response to the 1938 flood, Congress passed the Flood Control Act of 1941, which authorized the U.S. Army Corps of Engineers to channelize the Los Angeles River and parts of the Santa Ana. And that's why the L.A. River is a concrete flood-control channel instead of the wild-flowing river it once was. About Hill's Ranch Rodeo / Saugus Speedway. JN3801: 19200 dpi jpeg from original print | Online & archival digital images only.